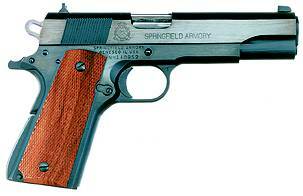 The Springfield Standard is a 1911 handgun manufactured by the Springfield Armory gun company. The Springfield Standard is a .45 ACP caliber, single-action, single-stack pistol modeled after the Colt M1911A1 pistol. This gun has a few enhancements over the original M1911A1 produced by Colt. However, the gun design stays mostly faithful to the original.